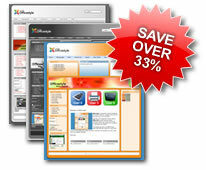 Toolbox:creations are offering you a 33% saving on their popular Officestyle series of themes. The Officestyle Triple Pack comes with the original Officestyle, Officestyle_silver, Officestyle_dark, full instructions and fully layered & sliced source files for each. Toolbox:creations have now also launched a support forum where users can exchange tips and tricks or request help from the creator when needed. Click here to visit Toolbox:creations for more information or to buy this triple pack.